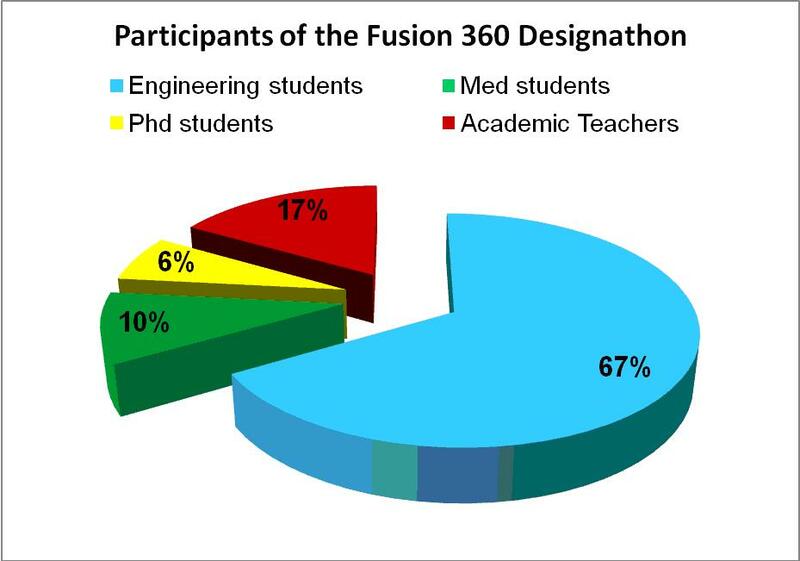 This case study concerns the European Design Marathon – Fusion 360 Designathon. Participants of this project, including certified Autodesk Fusion 360 instructors, staged two-day workshops at the Gdańsk University of Technology to promote interdisciplinary cooperation, combined with an Autodesk Fusion 360 operation basics training course. 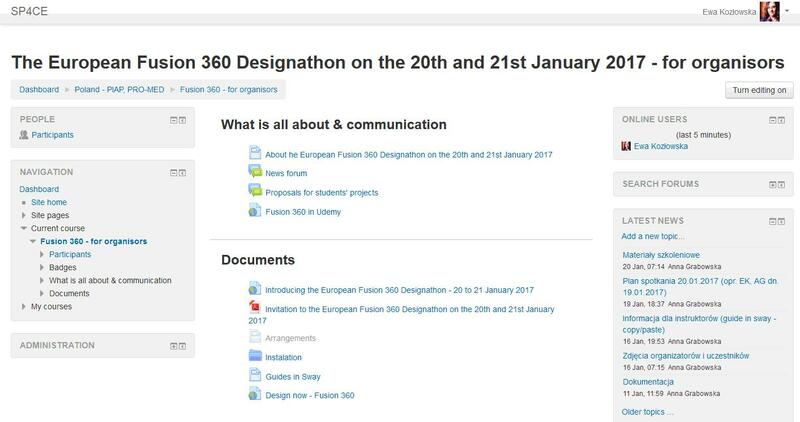 The overall aim of this undertaking was to present the SP4CE project and to make the participants familiar with a cooperation tool, the Moodle platform, used by the project partners and participants, to carry out a training course focused on Autodesk Fusion 360 operation basics, and to take part in the European Design Marathon – DesignNow The European Fusion 360 Designathon. Thanks to cooperation with the company PRO-MED sp. 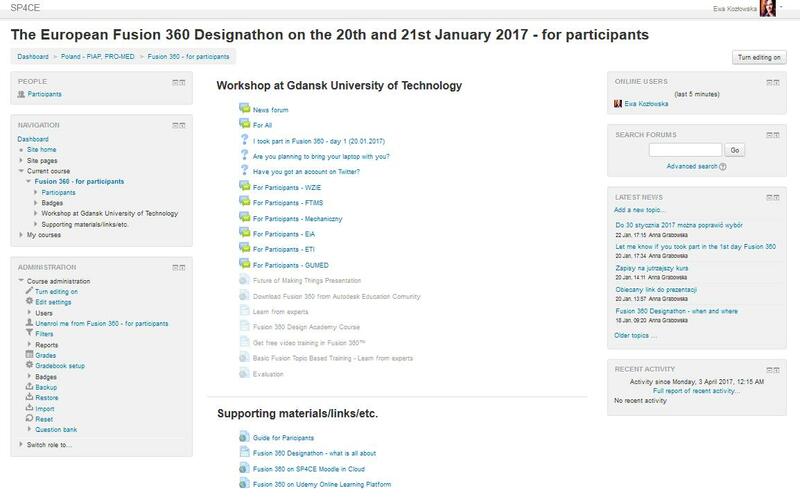 z o.o., the Autodesk Authorized Training Center of the Gdańsk University of Technology, and the Mathematics Teaching and Distance Learning Centre of the Gdańsk University of Technology, two-day SP4CE workshops were staged on 20-21 January 2017 at the Gdańsk University of Technology, dedicated to students, doctoral students, and university teachers of the Gdańsk University of Technology and the Medical University of Gdańsk. The portal http://sp4ce.moodle.pl/was used at each stage of preparatory works and during the workshops. 3 Learning Rooms were created. The organizers used the news forum and the discussion forum to plan activities and communication. The second Learning Room was set up for workshop participants, featuring the necessary organizational information, a notice board, and discussion forum functionalities. The same Learning Room was also used to monitor attendance and to collect statistical data about the workshop participants. The second day of workshops was staged in the third Learning Room. It was focused on the DesignNow marathon and team projects. Taking advantage of the functionalities of the Moodle platform, the workshops organizers divided the participants into groups and created separate discussion forums for each respective group. Files with projects designed by individual groups were then uploaded to the Learning Room space on the Moodle platform. How to use the SP4CE Portal? A coach (tutor) sets up the structure of the Learning Room in collaboration with the teacher (mentor). At this stage, coach and mentor discuss the existing and useful features and tools of the Learning Room, types of activities assigned to students (project teams, chat, forum, and workshop) and resources (books, files, catalogues, tags, websites, online resources) used in the Learning Room. Also, they both agree how the final performance of the students should be evaluated, and establish access levels. Coach (tutor) introduces the participants to the Learning Room, participants then register in the system via e-mail or by another means, and the coach assigns access key to the Learning Room. Students may use the available resources and other materials, communicate with the coach, mentor and other students, work on the assigned tasks and/or projects, browse or ask for new information. All stakeholders have the opportunity to take the best advantage of their skills and abilities to get the best final performance. Coaches (tutors) and mentors can effectively manage all tasks assigned to students. Coaches and mentors can also evaluate individual student performance. Users must first register to the system to get an access key to access Learning Rooms. There is an online registration option, and the key can be sent via e-mail by the mentor or the system administrator. No special software is needed to be able to use all Learning Rooms features, except for an internet browser at the user’s choosing (Google Chrome, Mozilla Firefox, and Microsoft Edge). Solving specific problems and tasks may require special software, but the users have to be notified in advance. Students may use MS Office – MS Word, MS Excel, and MS PowerPoint – when working on project proposals and/or reports. The current system version offers all functionalities necessary to effectively support active learning. User roles are clearly distinguished. The system streamlines learning as it actively monitors the learning process and the dissemination of resources. Moreover, the learning process can be extensively personalized, which is a particularly valuable feature given the wide and varied fields of knowledge and expertise covered by PRO-MED operations. Participants who successfully completed the European Fusion 360 Designathon workshops were awarded a training completion certificate. Some of the trainees declared they were interested in other PRO-MED projects. Risks associated with the assignment of tasks to workshop participants; inadequate training before entrusting tasks to trainees. Risks also include too many trainees taking part in the workshops, in which case it would be difficult to adopt an individual approach to trainees, or inadequate difficulty level of tasks versus skills and knowledge level of workshops participants. Trainees should not be assigned too complicated / unclear tasks. In this manner, students are not given any tasks which are not within their field of competence. On the other hand, students may feel discouraged or overwhelmed by tasks which they finds too difficult. It is also often the case that students find it difficult to begin working on the task, and the coach should actively motivate students and offer them full support, especially in the beginning, for example by presenting examples of solutions to similar problems. It is important to post the necessary training resources and source materials that the students may use to deepen their knowledge at their own pace and on themes chosen by themselves.